Local peach season is in full swing here in Ontario and thankfully it seems we’ve been blessed with a great crop this summer. 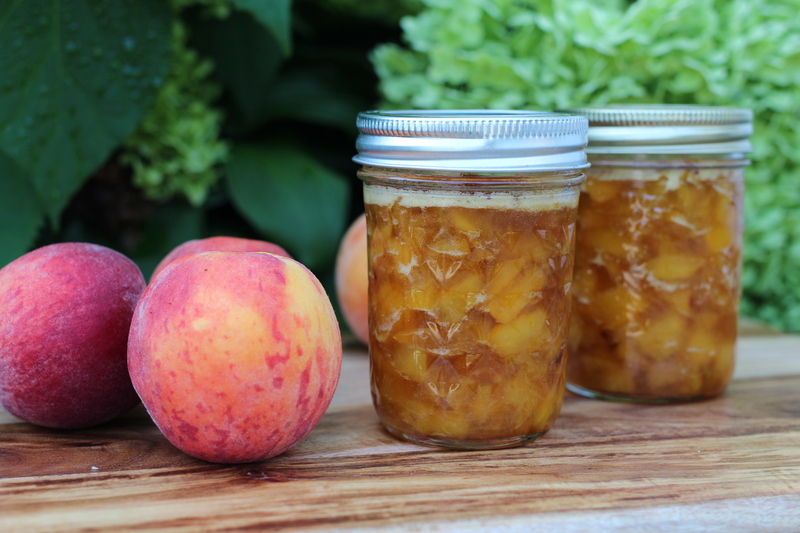 The peaches we’ve enjoyed have been sweet and drip all over your face juicy. This week, I came across an offer I couldn’t refuse! $2.96 for a 3L basket of peaches. I left with six! (Each one holds approximately 12 peaches.) The kids and I put one down just eating them fresh. Then we had five baskets left that I was determined to preserve so we can enjoy them when the snow blower is out and I’m dreaming of summer. This project took two hours and forty minutes. I have to mention that I was much faster than usual, as the kids are visiting grandparents and I didn’t have any “helpers”. Get out your equipment. Last night I washed up the dusty jars that were in the back of the cupboard and pulled out a bunch of plastic containers. 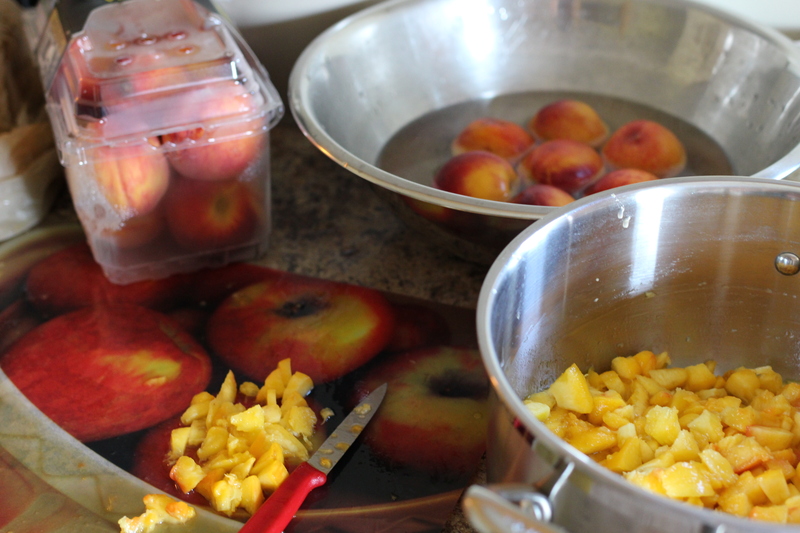 This morning, I used a flexible cutting board, a sharp paring knife, a large bowl to pour boiling water over the peaches. I also set up an area for the compose waste (skin, pits) and used two large pots. I worked on several things at the same time and shock horror, I didn’t use a recipe! Like many things I do in the kitchen, I just sort of went for it. Boil water and pour over about six peaches at a time. Let sit for about a minute. Then pour the water out and grab a (hot) peach. Be sure to use the fresh, super hot boiling water or this doesn’t really work. Others will recommend that you follow the hot water with a plunge in a ice bath but I couldn’t be bothered with this extra step. What happens is amazing! 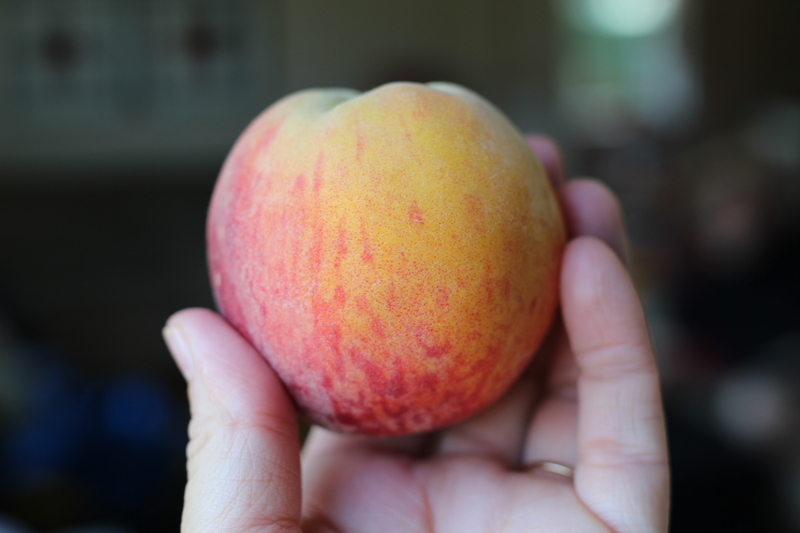 On a few peaches, the skin will peel off virtually in your hand. However, for most I suggest you score two large circles to create quarters. Then starting from the X at the bottom, peel the skin off. It’s amazing how easily the skin will pull away having dipped them in the boiling water. NOTE: On peaches that weren’t perfectly ripe, this didn’t seem to work and I had to just peel them carefully, sort of like an apple. The perfect looking peach slices went into a plastic container. I occasionally squeezed a slice of fresh lemon over them to keep them from browning. When full, I realized I didn’t have any orange juice to submerge them in and didn’t want to make a sugar syrup. Necessity being the mother of invention, I poured a mixture of 1/3 real maple syrup with 2/3 water, into the container to cover the peaches. Then, I crumpled parchment paper (you could also use wax paper) to cover the top. Doing this pushes the peaches into the liquid so they don’t dry up. Then add the lid. Freeze until ready to use. 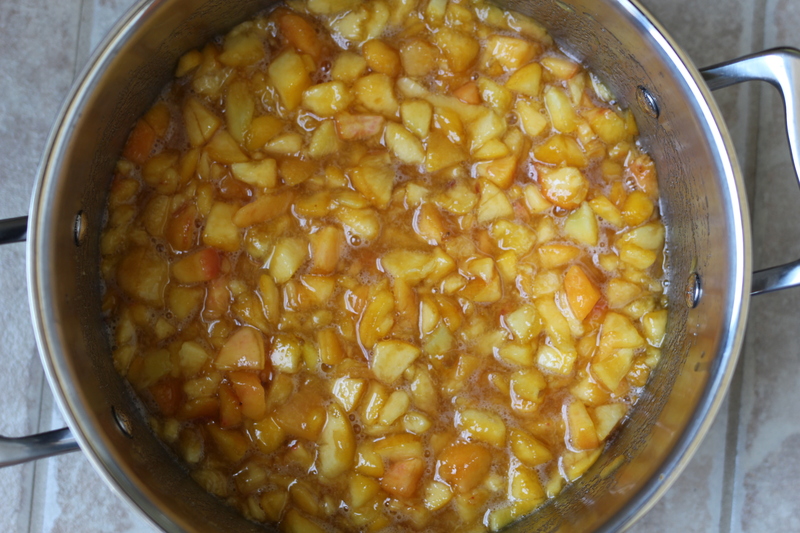 For any peach pieces that had ragged edges or were slightly soft, I cut into small pieces and transferred to the pot. I kept going until the pot was half full, then added 3 cups of sugar, a generous squeeze of lemon juice and 1 actual slice of lemon. This was cooked over medium heat for about 40 minutes. This cooking time may be a little long but I was so busy working on the next batch I sort of forgot about it! Be sure to stir regularly or your mixture will stick and burn on the bottom! I almost got caught out here and would have been really cheesed off if I’d lost all of that work! My jam is darker than I expected (probably because I cooked it for so long) but tastes GREAT so no complaints. When it was done, I used a soup spoon to ladle it into the jars (and one plastic container because I ran out of glass jars), let cool slightly and then covered. One is for the fridge, the rest is for my large freezer. I realize that there is a little “foam” on the top of my jam. This doesn’t bother me…I’ll just stir it in later! I also wanted to make a preserve without much/any sugar. In my second pot, I added peach pieces until the pot was just over half full, a good squeeze of lemon, about 1 tbsp of cinnamon and 2 tbsp brown sugar. This was cooked for about 15-20 minutes on medium heat. Then I pureed it with an immersion blender in the pot. It was still very hot and I was careful not to splash and therefore scald myself! 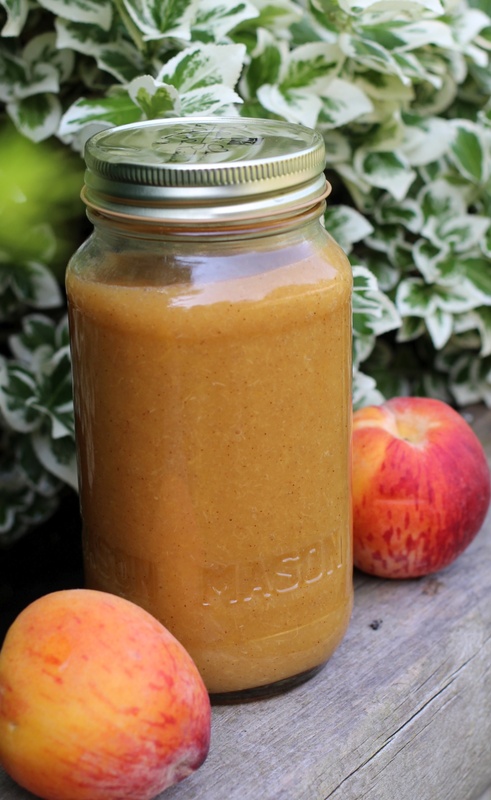 This peach sauce is not as sweet as the jam but will be perfect for us to pour over our pancakes, add to oatmeal or yogurt. Again, a little will go into the fridge and the rest will be frozen until we are ready to use it. And that’s it! 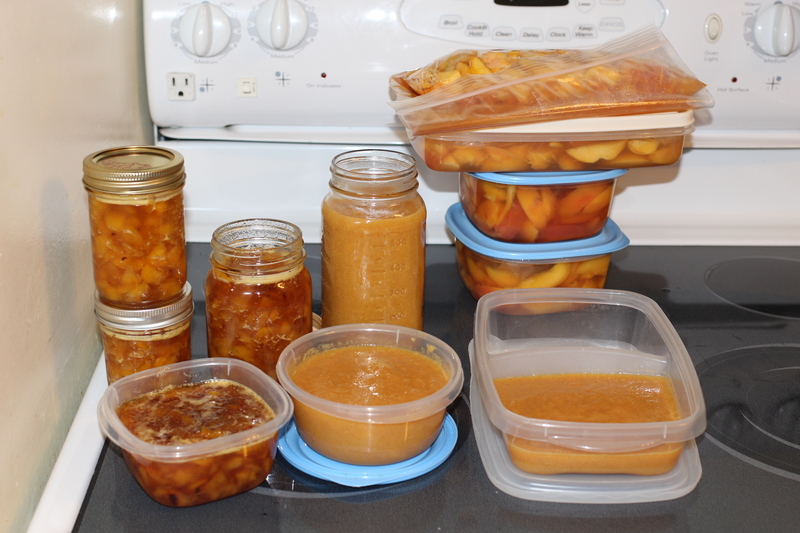 With five baskets of 3L peaches, and just under three hours (including clean up), this was the result! Beauty! !